Paid about $2 for these in Tortola. They were great in curry! We kept seeing canned pigeon peas in Caribbean supermarkets and I had no idea what they were, what they tasted like or what to do with them. Seeing them canned with coconut milk intriugued me further, figuring they’d be great in curry. 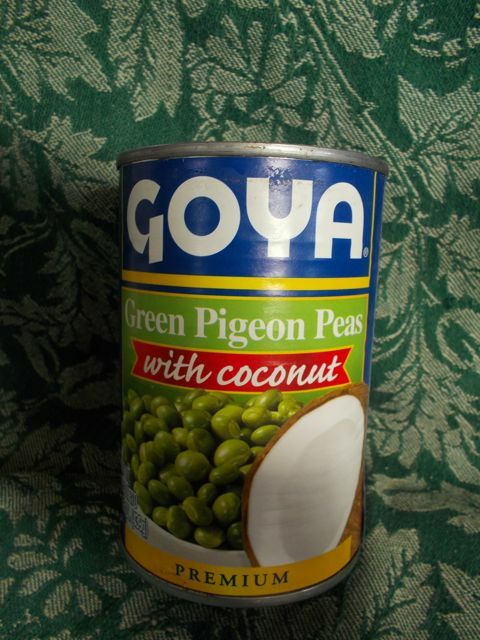 The checker in the Fat Hog Bay Tortola IGA said she used pigeon peas in curries and stews. Why not? They were great in curry, very earthy tasting, almost nutty. Then I got braver, and reconstituted the dry ones, then cooked them with sofrito – a tomato – bell pepper – onion sauce and rice. Also good. Did a bit more research and came across this tasty-looking classis Puerto Rican dish: Rice with Pigeon Peas - Arroz con Gandules (click here for recipe). Once we finally escape St. Thomas, Puerto Rico is our next stop. Sounds like a Puerto Rican Arroz con Gandules local food junket is in order! I wondered, though, are pigeon peas healthy? Yes! High protein, excellent roughage and a good source of B vitamins (according to these guys … click here). They’re also healthy for the environment; great at pumping nitrogen back into the soil. Good livestock food, too. Beans? Peas? Whatever. They’re good and deserve further exploration. Give ‘em a try! Ethereal -- enjoy! Let me know how they work out for you. Will be curious to see what Publix sells them for once we get to Florida. Looking forward to trying pigeon peas in some roadside stand in the Bahamas -- once we finally get there!!! -- so I can pick up some more prep tips.